Late last month, Anandtech detailed the signal strength drop-off experienced by iPhone 4 users when bridging the antenna gap at the lower left corner of the device, mapping how the "bars" of signal strength shown on the device correspond to actual signal levels and how holding the phone in various positions affected that signal under iOS 4.0. Anandtech has now followed up with a test on Apple's iOS 4.1 beta released yesterday that includes changes to how the visual "bar" indicators correspond to actual signal strength. Anandtech has also confirmed that the changes in today's iOS 4.0.1 update have the same effect. 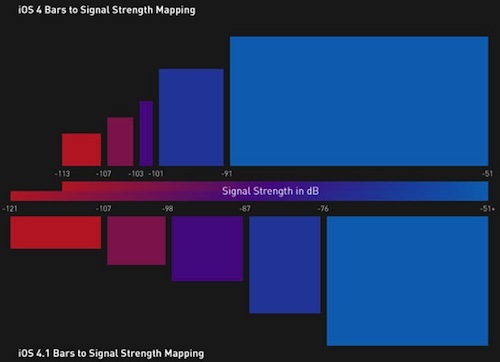 The results are conclusive - Apple has dramatically changed the signal strength to signal bar mapping in iOS 4.0.1 and the iOS 4.1 beta, making the dynamic range not only much broader, but the range values for each bar much wider. The range of signals that correspond to bars three and four are the same width, and bar two is only slightly less. The cutoff value for two bars to one bar remains the same, but every other value has increased. The result is that the worst case drop of 24 dBm no longer makes all the signal bars disappear, but rather two. Notably, Apple has adjusted the bar scale such that the lowest bar remains visible at a signal level down to -121 dBm, significantly lower than the -113 dBm limit in iOS 4.0. Anandtech's report claims that voice and data transmission on the iPhone 4 remained intact all the way down to -121 dBm, bolstering Apple's claims of increased overall sensitivity and reception with the iPhone 4's design. The report claims that Apple's changes are doing away with a cover-up of AT&T's poor network coverage in many areas and will likely result in some confusion as customers see fewer number of bars than they are used to. The fact that Apple has also increased the heights of the lower bars alongside the change to the mapping of actual signal to bar display appears to be a ploy to somehow makes things appear better than they are, with the subtle, but baseless, suggestion that taller bars imply better signal. The new signal strength visualization in iOS 4.0.1 is simply going to be more honest with iPhone users. Whether that's going to result in customers confused about why their phone performs "worse" after the update or simply get really mad at AT&T remains to be seen. Regardless, many observers are expecting to hear more about Apple's response to the signal issue at the company's press conference scheduled for tomorrow. While the company's changes to the signal strength mapping and display may offer a more accurate representation of cellular coverage in a given location, it does not yet address the actual drop in signal seen with the iPhone 4's antenna design.